Heat oven to 350°F. Lightly spray 13x9-inch (3-quart) glass baking dish with cooking spray. Separate dough into 8 biscuits. Cut each biscuit into 6 pieces; place in medium bowl. Sprinkle with 1 tablespoon of the taco seasoning mix; toss to thoroughly coat. Set aside. 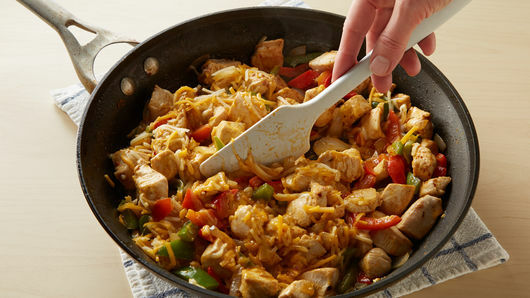 In 12-inch nonstick skillet, heat 1 tablespoon of the oil over medium-high heat. Add peppers and onions; cook 4 to 7 minutes, stirring occasionally, until tender and starting to brown. Remove from skillet to medium bowl. In same skillet, add remaining 1 tablespoon oil; add chicken. 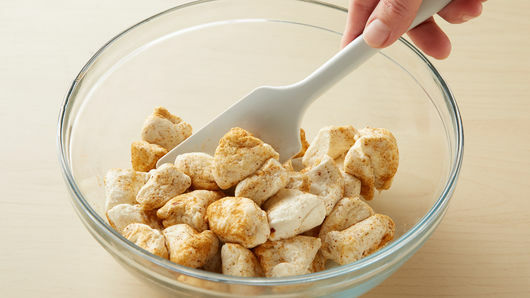 Cook chicken over medium-high heat 5 to 7 minutes, stirring occasionally, until browned and no longer pink in center; drain. Reduce heat to medium; return pepper and onion mixture to skillet with chicken. Sprinkle remaining taco seasoning mix over mixture in skillet; stir thoroughly to coat. Cook 1 to 2 minutes or until mixture is heated through. Remove from heat; carefully stir in 1 cup of the cheese. Spoon hot mixture into baking dish. Top evenly with biscuit pieces. Bake 20 to 25 minutes or until biscuits are thoroughly baked and golden brown. 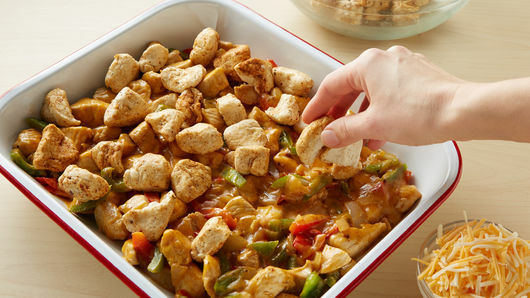 Sprinkle remaining 1 cup cheese over top; bake 3 to 5 minutes or until cheese is melted. Serve with remaining ingredients as toppings. 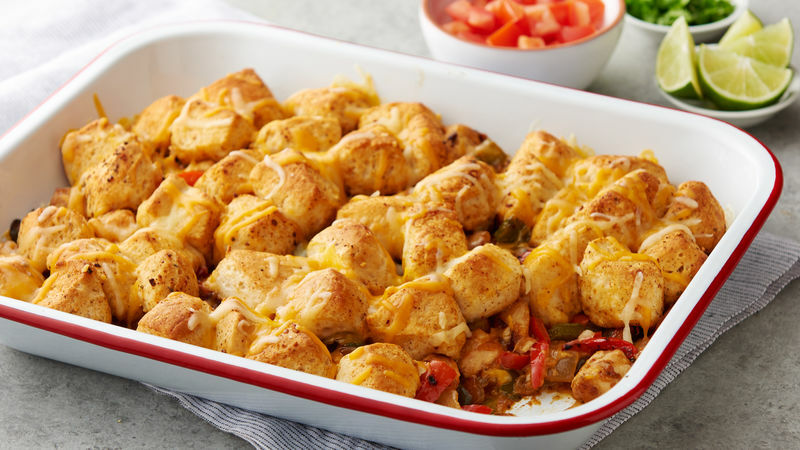 Make sure your chicken and vegetable mixture is heated through before transferring to baking dish and topping with biscuits. This will help biscuits bake through. This dish is best served immediately.